That we are in a position to give something back to the harp community is one of our greatest sources of professional satisfaction and pleasure. Our sponsorship activities are energetic and wide-ranging. Classic international competitions, all-genre festivals, individual artists and giant mechanical spiders all feature regularly in our work. It is important to be diverse and open-minded, because diversity creates the greatest number of thriving musical careers. Creativity and exibility are essential, and so is focus. All our sponsorship – group, individual, on a local, national or international scale – is also underpinned by some core principles. These center on a clear-eyed vision of both artistic and business concerns, and on a relationship between the two dimensions that is rooted in integrity and trust. Harp makers could be considered among today’s patrons for harpists. Music has always had a relationship with patronage, be it from the court, a business, charitable foundations or kind parents. But we are not managers: we make and sell harps. When we sponsor harpists, we want therefore to arrive at intelligent projects that the harpist is then able to develop, continue and continue to benefit from on their own. Festivals are particularly dear to our hearts and the spirit of our company. We love their open, enquiring and celebratory spirit, full of friendship and discovery. The global musical marketplace is busy, which can give rise to the idea that one must compete with one’s colleagues. But even if this idea were not unpleasant, in music it does not even work. Financial undercutting, for example, eventually prices everyone out of a living; a targeted clash of events reduces audiences for both. Practice solidarity, and for whatever reason everyone is better off, even in difficult times. Unlike funding from a disinterested source (such as a charity or musical foundation), harp maker sponsorship is a type of business sponsorship. Business sponsorship necessarily involves business concerns: someone who banks with bank A is unlikely to be sponsored by bank B, for example, nor someone who drives car X by car firm Y. While our sponsorship is connected to the instrument you buy, it remains a terrible idea to buy a particular harp because of what one hopes to get from the maker. An artist’s choice of instrument is at the heart of their artistic identity. It is their voice, the vessel to express what lies within their soul. As with most things in life, if what lies behind this choice is not true, what is built on it will collapse. No manufacturer / artist relationship functions well without genuine enthusiasm from the artist for the manufacturer’s instruments, and respect for artistic as well as commercial concerns on the part of the manufacturer. Sponsorship needs this fundamental integrity in order to work. What sort of harpist do I need to be in order to be sponsored by Camac? Do I need to be young, or to have won a big competition? We welcome applications from everybody, regardless of age, nationality or the type of harp-playing you do. Whether you are professional, amateur or a student, playing classical, jazz, rock or Celtic music, performing a solo recital or organising high-level background music, creating an installation or composing, if you have a good project, we’d love to hear from you. How should I apply for sponsorship? This is entirely up to you. A letter or an email is often all that is needed. Will you give me a harp? No. Sorry! We never do this, because we couldn’t afford to do it for all the deserving cases we come across, and we have to be fair. We can sometimes offer you a deal e.g. if you buy more than one harp, or represent an educational institution, but that’s it. I don’t play a Camac harp. Will you still sponsor me? Maybe. You can’t buy Lufthansa flights with your Air France miles, nor would you be sponsored by Citroën if you drove a Renault. The choice of an instrument is a gesture of faith in the maker on the part of the artist, and it is important to us to prioritise our clients, and be worthy of their trust. If you don’t play a Camac harp, your proposal will be more likely to succeed if it has something to do with our harps. 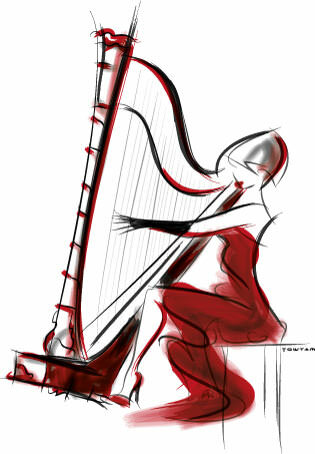 We support festivals and competitions where any and all makes of harps can be played, for example. A project that definitely wouldn’t be sponsored would be a CD you are recording on your non-Camac harp, or something you are playing your non-Camac harp in, but that doesn’t really have anything to do with the harp beyond that (like a theatre play). So, if I buy a Camac harp, you’ll then sponsor me? Artists are often under considerable pressure to sign up to this idea. In all honesty – this is a terrible reason to buy a harp. Unlike funding from a disinterested source, funding from a harp maker involves something at the heart of your artistic identity: your choice of instrument. Your instrument is your voice, the vessel to express what lies within your soul. As with most things in life, if what lies behind this choice is not true, what is built on it will collapse. Before anything else, you should buy the harp you love the most. Can you make my career? No. We help you make your career. 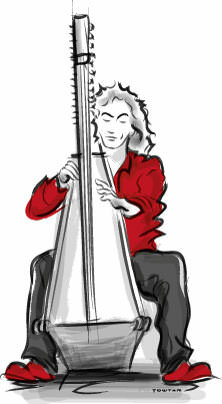 Harp manufacturers are a major source of funding for harpists, because it is a niche world, and instrument makers are the most interested commercial bodies. We are among today’s patrons for harpists – and music has always had a relationship with patronage, be it from the court, a business, charitable foundations or kind parents. But we are not managers: we make and sell harps. One of our key aims, therefore, when we sponsor harpists, is to arrive at intelligent projects that the harpist is then able to develop, continue and continue to benefit from on their own. Musicians’ individual paths are very open, very diverse, and it is openness and diversity that will build the maximum number of musical careers. This is the healthiest type of harp firm sponsorship. The person who really makes your career is you.